Yesterday, I spent hours and hours hanging one of my new polish shelving systems. I wanted something with a TON of storage. But I also wanted it to be a piece of art in and of itself. I just couldn’t get excited about the traditional acrylic polish racks. I knew I wanted something glass or metal and very clean and minimal. Awhile back, I had the bright idea to use cabinet pulls from IKEA. After bringing home at least four different types, I finally found STRECKET. These stainless steel cabinet handles come in packs of two. They are about 12 ½ inches long with a 1 ¼ inch lip. They are pre-drilled with two holes and come with four screws. The regular IKEA price was $7.99 per pack. But just my luck, there was a wire basket of these babies sitting in the aisle way with a magical yellow sign. Are you ready for this? $0.49/each! Yup. Forty-nine cents! How can that even be possible!?!?! I grabbed as many as I could…40 packs. That’s 80 shelves for $20. Not bad, huh? 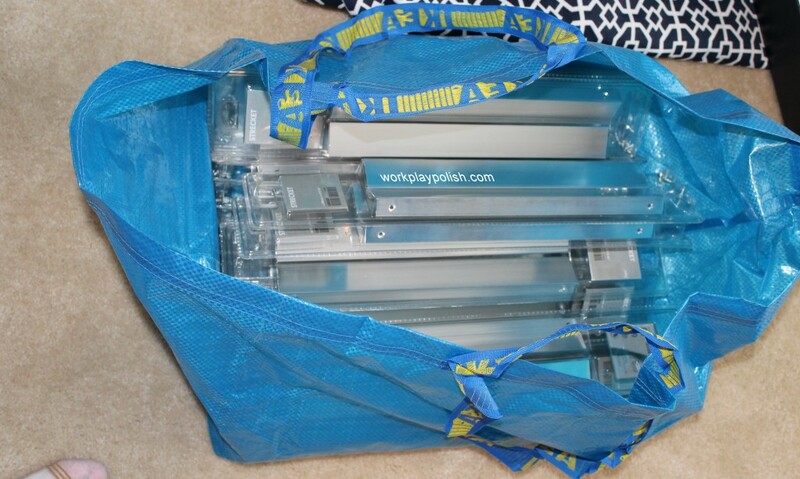 People were staring at me as I shoveled the packs into my IKEA bag/cart. Whenever I made eye contact with any of the gawkers, I’d defensively say “Yeah…these are polish racks…and they’re going to be very cool.” I must have looked like a crazy lady! The only downside is they aren’t deep enough to fit China Glaze, Orly or Revlon. I‘ll eventually build different, more traditional shelves, for those polishes (wood, white, molding, etc.). I like the idea of having more than one “vignette” of polish in the room anyway. So back to the STRECKET shelves. Installation was a lesson in patience and mathematical prowess. I measured, measured some more, divided, added, moved, leveled, sketched, spreadsheeted and even PowerPointed this shelving wall! Once I got the hang of it, it wasn’t so bad. The key is to make each shelf level all on its own. I used the adjacent shelving for spacing and consistency, of course. But the wall bows and the shelves aren’t perfect either. So if you rely solely on the shelf you last hung – a 1/16” mistake on shelf two will turn into a five inch mistake on shelf 32. The shelves won’t bear much weight. I added a touch of glue on each screw as I installed it to the wall. 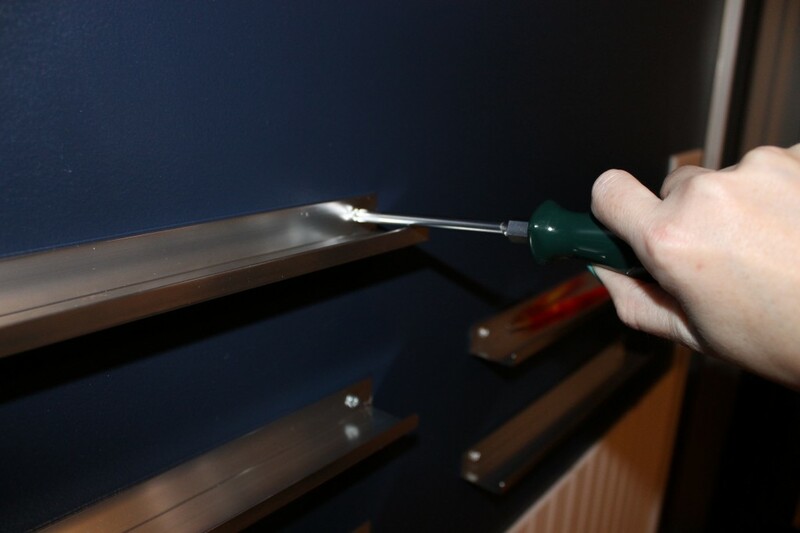 Screws are meant to be installed on the other side of the handle (where there's a recess) so they aren't flush. I decided this didn’t bother me; especially since it will be covered with polish eventually. I’ve installed eight rows of five shelves. Each shelf holds about ten bottles of polish. So that’s 400 bottles of storage now. I have many more shelves, so I’ll grow “up” and can add another three rows of five when I need them. Isn't it just so orderly and organized. I can't wait have all of my polish on the wall eventually! But Leslie, you say, wouldn’t it have been easier to hang a few big long shelves? Yes. But I decided against this for a few reasons. 1) I like the look of having the separation on the wall. From a “decorating” perspective, it’s more interesting. 2) Having long rows of polish is bothersome if you’re adding or rearranging polish. If you add just one bottle, suddenly you’d have to push 60 bottles down a shelf to make room. That’s easier said than done. 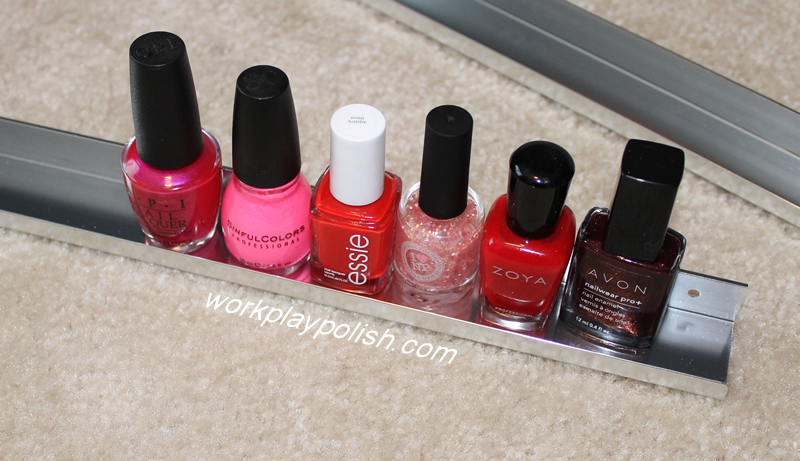 With smaller shelves, moving polish around is more manageable and separating polishes by brand looks cleaner. And finally, 3) The STRECKET handles don’t come in a longer length. I don’t believe IKEA is making STRECKET any longer (hence the deep discount) but you can find them on eBay. Even though you can’t create these exact shelves…knowing that cabinet pulls are an option, it definitely opens the possibilities. I’m sure there will be new IKEA handles which will also work. Or, look at Lowe’s, Home Depot or any other home improvement store. 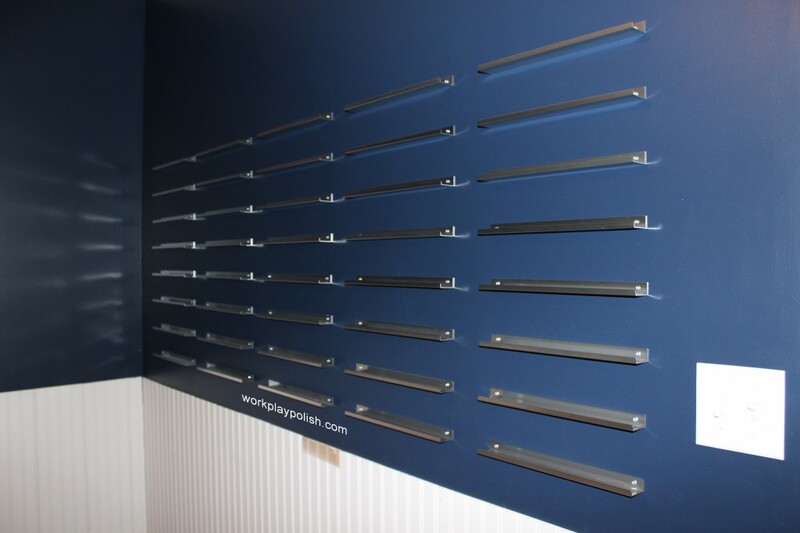 I think it would be neat to use many different handles on one wall.